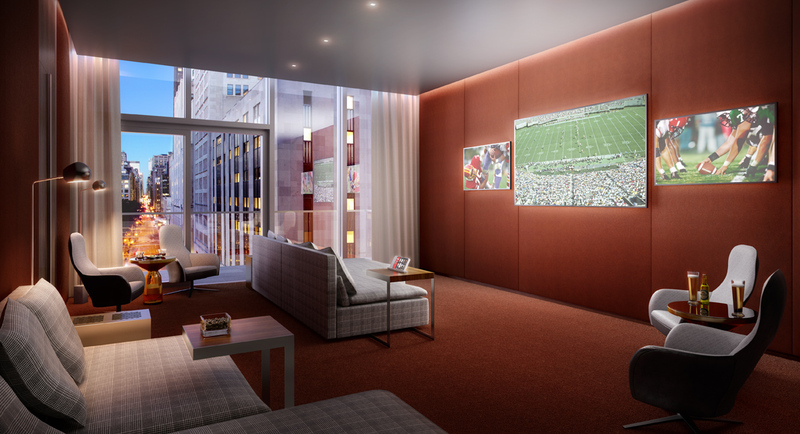 One Madison Park, one of Downtown most awaited new development designed by Cetra/Rudy, is finally seeing the light of the day, or should I say, the end of the tunnel. 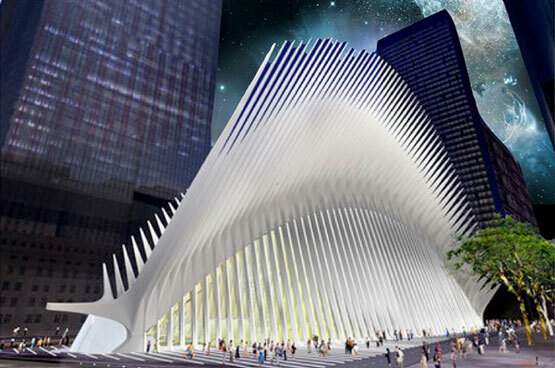 Indeed, this magnificent development went through financial and legal turmoil, which stalled its progress. Another anecdote talks about a couple of residents, who bought on floor plans and decided to settle in the unfinished building, which later fell in bankruptcy. 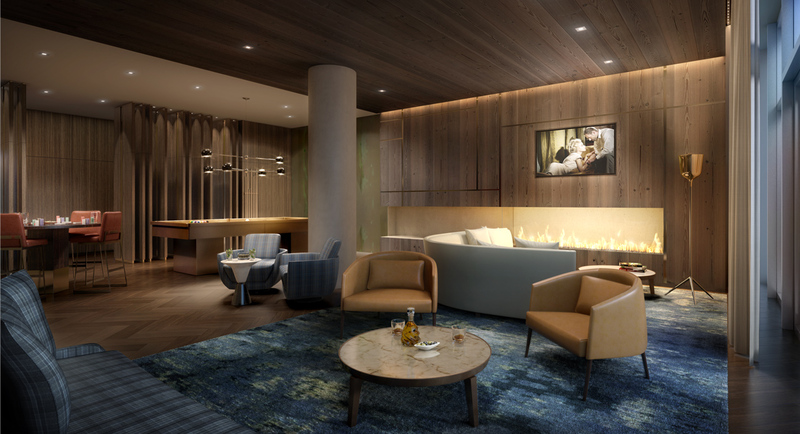 Fortunately, for these residents and excited buyers eyeing the Downtown market, One Madison Park is ready for completion and closings are happening as early as the 1st quarter of 2014. 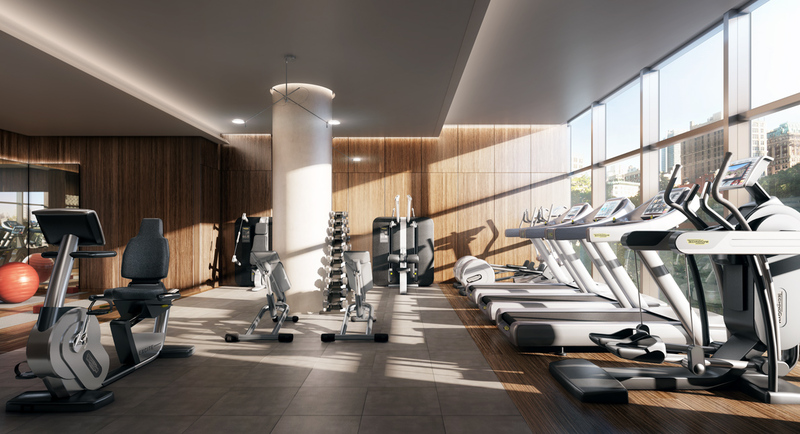 Developer Related led the rescue scenario which included creditors CIM and HFZ Capital, as well as interior design firm Yabu Pushelberg hired to finish the remaining half of the units, the lobby and amenity spaces. 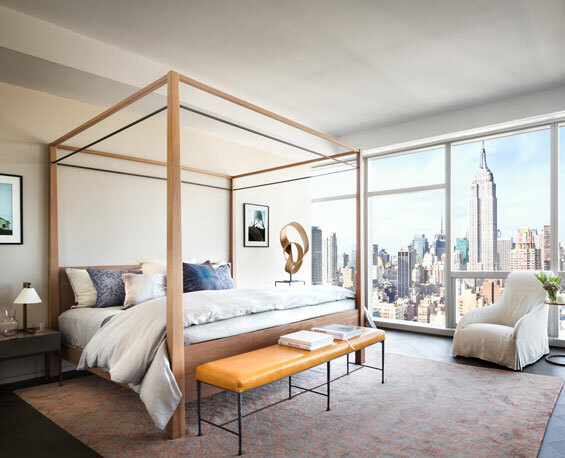 A couple of months ago, Related already had a successful experience with a similar situation at 225 Rector Place, a bankrupt building, that they transform into one of the most successful Battery Park City condominium. One Madison Square Park stands upon a unique location, where Downtown meets Midtown South, and at the crossing of the Flatiron, Gramercy, NoMad and Chelsea neighborhoods. 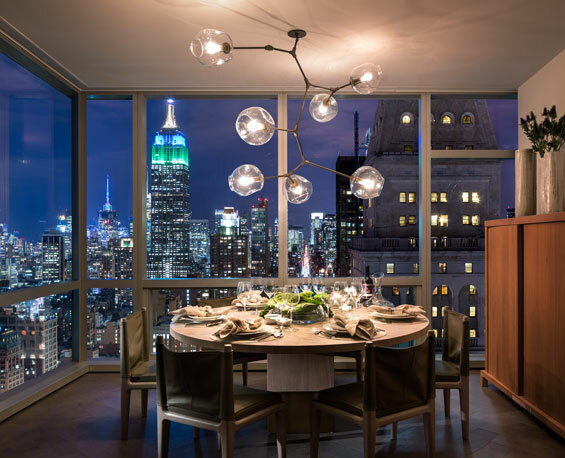 Facing the beautiful Madison Park, residents can enjoy the change of the season sceneries along with 360 degrees breathtaking views of Manhattan. 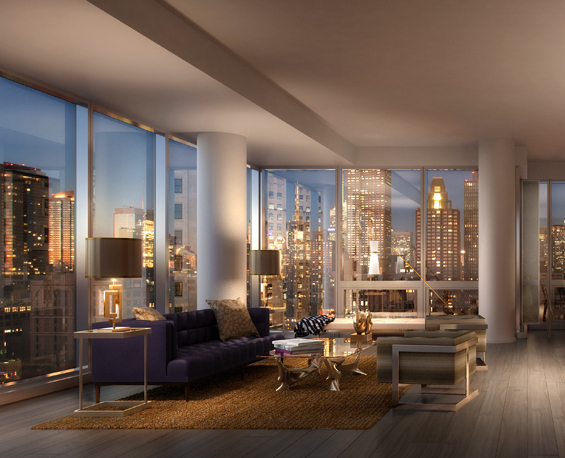 No other residential building in NY offers these views – it’s a feature that you would only find at One Madison Square. 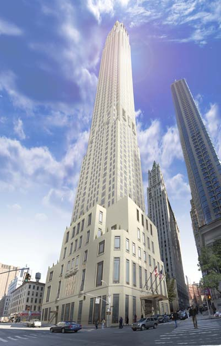 To preserve the residents privacy, the entrance of this 60-residence only boutique condominium is located at 23 East 22nd Street above which a duplex and triplex units will be available for buyers who prefers a “townhouse” living style to the “perched-in-the-sky” condominium. The lobby will be filled with marble walls and sculptural element. 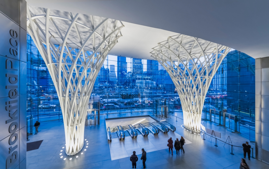 “A slender water feature casts light and shadow behind tall wood columns and a soft mosaic-patterned custom rug leads guests to a curated permanent art installation created specifically for One Madison”. 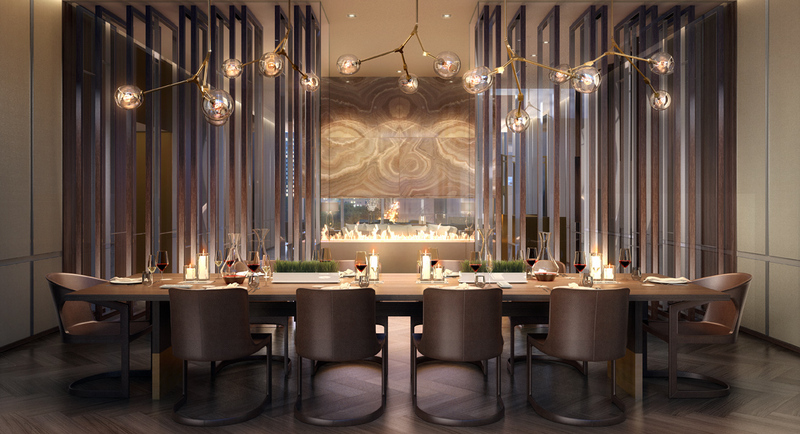 As mentioned above half of the residences feature Yabu Pushelberg interiors and the other half Cetra/Ruddy interiors. 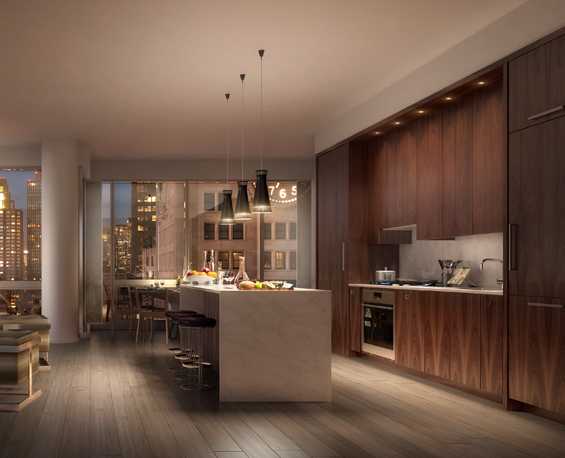 Yabu Pushelberg (see pictures below) brings a contemporary, elegance and calm environment to full floor residences. 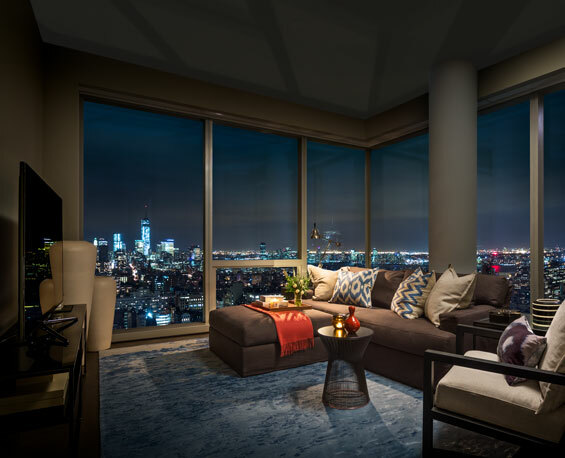 Living rooms layout with open kitchen and a set back with dining areas offer multiple views of the Manhattan skyline from one room, ideal for casual get together or dinner with private chef enjoying the top of the line kitchen features. 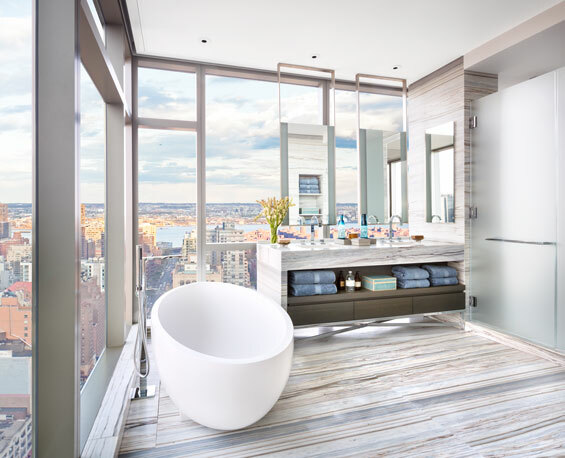 The master bedroom on full floor overlooks Madison Avenue and the Park, while the baths covered in custom blue Cippolino marble vanity with grey stained European oak cabinetry creating the feeling of a spa. The Cetra/Ruddy interiors (see picture below) are a “Modernist-style celebration of natural light and expansive skyline views” and feature lighter finishes such as wide plank solid white oak flooring and finishes in light hues which the loft like interior with sky high living, custom kitchen in satin-rubbed Indian Laurel veneer, and marble countertops. The baths feel like zen havens filled with stone surfaces from Italian travertine to rich marbles. The amenities and service level brought by related have been curated to meet with the future owners high expectations and demands. 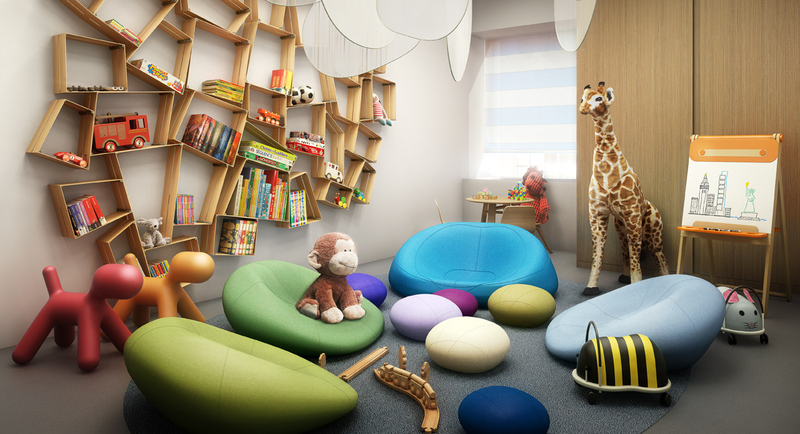 To that extend, the One Club will provide assistance with everyday needs as well as access to the most exciting activities and entertainment the city offers. The assistance extends to the organization, design and planning of private event within the building. The amenities include an upscale dining room to provide owner’s guests with cocktail and gastronomic parties thanks to the butler’s service and gourmet catering kitchen. 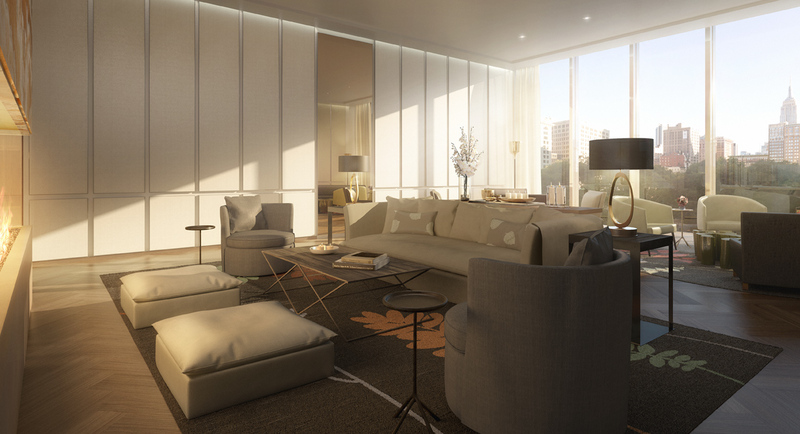 A screening room, lounge and entertainment rooms are available for relaxing outside your apartment. 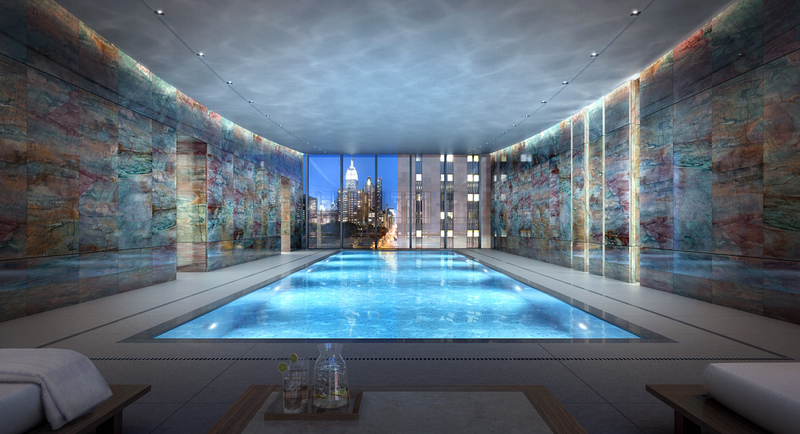 Residents can take relaxation to a higher level by enjoying the 75-foot pool and spa, located next to state-of-the art gym and yoga studio.